Search Results for "fly clear water"
Flying over crystal clear open water. View of the altitude of the nature of Norway. Sunshine. Birds fly above the water. Beautiful, clear sea. The wind blows vigorously. 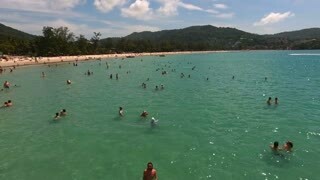 Beautiful clear water beach fly over of a large group of paddle boarders paddling out. Fly over boats anchored on a clear water beach. Flying above beautiful norwegian fjord with crystal clear water surrounded by high mountain peaks. Lofoten islands near Flakstad. Aerial 4k Ultra HD. Fly away from Bled castle on a sunny day 4K. Aerial shot of famous old castle over the top of lake Bled on a beautiful weather and crystal blue water. Stunning aerial drone zoom out shot of a rock island in the Mediterranean sea near the coast Elafonisi Beach, Crete, Greece as a bird flies across from left to right. Beautiful clear blue ocean water. Flying over an exotic beach with Palm trees and crystal clear water in Dominican Republic. It looks like paradise. VARADERO, CUBA - MAY 25, 2016: Drone flies over tropical island on a clear day. Calm Atlantic Ocean and the bay. Flying over the city. Bird's-eye view to beach strip with white sand and azure water on the coast.